Matrix, Unilevel, Binary, Matching Bonuses, Fast Starts, Spilling, Compression… what do these terms mean and how do they all fit together? Each is a component of the MLM compensation plan, the vehicle by which you will reward your distributors for their sales activity within your company. Understanding the various compensation plans, bonuses and commissions as well as what each is intended for is integral to your ability to design a plan that will work well for you company and meet its needs. “The Compensation Plan Primer” is your definitive resource for learning about compensation plans as they relate to MLM. This book was authored by MLM professionals John Pierce and Peter Spary. Both John and Peter have worked on the implementation and design of thousands of compensation plans. Put their experience to work for you with “The Compensation Plan Primer” ! 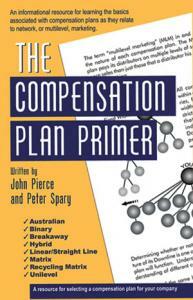 “The Compensation Plan Primer” was co-authorized by Peter Spary and John Pierce. Peter has been involved with MLM for over a quarter century. Starting as a distributor in 1972, Peter learned the ins and outs of multilevel marketing through hands on experience, hard work and persistence. Over time, Peter rose to prominence as the top distributor for two MLM companies prior to launching his own and ultimately branching out to become a service provider to the industry. Peter’s unique blend of experiences from the distributor, company owner and service provider perspectives has instilled in him an ability to craft solutions that address the diverse needs of different groups. Paramount amongst Peter’s many achievements is the founding of MultiSoft Corporation, a preeminent software and solutions provider to the network marketing industry since 1987. Continually active in his pursuit of innovation, he remains committed to providing quality consulting and software through MultiSoft. John’s experience with MLM compensation plans is a unique one. He began working for MultiSoft Corporation in 1997 as a technical support representative. Seeking advancement, he asked the owner of MultiSoft, Peter Spary, what he could do to further his position with company. The answer was simple: “Learn compensation plans inside out and you will have a future with the company”. Many years and thousands of compensation plans later, Peter held true to his work with John having served in the capacity of Chief Operations Officer, President and Publicist for the company. During his time with MultiSoft, John has reviewed nearly every compensation plan to come through the door, authored over one hundred of his own plans and participated in numerous consulting sessions related to them. This resource will provide you with an understanding of compensation plans through the eyes of those that have made them their living.